I’ve been working with a talented client who has hit a critical setback in her career, and she’s considering abandoning her big project. It’s an extraordinary, worthwhile project too, that has the potential to upgrade her career to a much more lucrative and respectable place! I keep pointing out the fact that a setback or crossroads may have all the markings of a logical stopping point, however it can also be a self-imposed halt in the action; depending on how committed you really are, your tolerance level for uncertainty, your ability to hunker down, take risks and push through, and where YOU ultimately plant the stop sign. 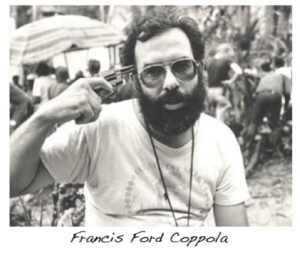 I worked with Francis Ford Coppola in post-production on the Godfather. Paramount insisted on using the world-class film processing company, Technicolor, and I was lucky enough to be asked to join the team. I was working in a department called “answer print” at the time, and I was charged with keeping track of each and every scene of the movie, while at the same time Francis and a “color timer” corrected the “sepia tone” color of each scene. It was a 4-month gig, on what would turn out to be the greatest film of all time. At one point Francis told us the story of while they were in the throws of shooting, he was constantly being threatened and challenged by the producers; why are you so far over budget? Why do the dailies look so dark and faded? Why can’t you keep the production on schedule? He said directing the film was a huge technical challenge itself, however dealing with the suits made his job almost impossible. In fact he shared that he was once in a bathroom stall when he over heard two guys talking about how terrible a director they thought he was. He says that he lifted his feet because he was afraid they would recognize his shoes. Important because it leads me to the question, where do you stop? Do You Stop when the money runs out? Do you stop because you just don’t know what to do next?